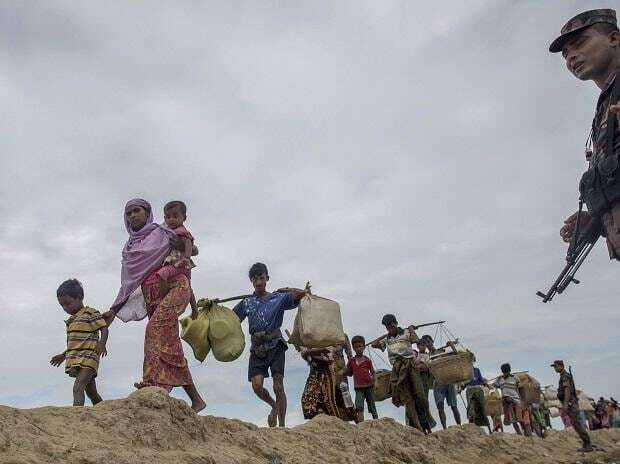 The BSF on Sunday said that the 31 Rohingya refugees apprehended from the 'zero line' between India and Bangladesh's border near Tripura's Rayemura were "pushed" by the Border Guards Bangladesh (BGB). On January 18, BSF troops posted at the border observed 'suspicious movement' from the Bangladesh territory. Later, the BGB made a telephone call and confirmed the activity, discovering a group of Rohingya refugees, BSF DIG Brajesh Kumar told ANI. A total of six men, nine women, and 16 children were found trying to enter into India. The BGB alleged that the Rohingyas were "pushed by the BSF," into their territory. "We alerted our troops and next morning approached the BGB to hold a flag meeting. The meeting was held on January 19. They said that there were 31 Rohingyas and claimed they were pushed by the BSF towards Bangladesh," Brajesh told ANI. Refuting the BGB's claims, the BSF asked them to identify lapses in the Indian side of the fence and show the place from where the crossing might have happened. "But they could not justify their allegations. They only keep harping that if they are on the Indian side, the BSF should take care of it. In fact, we later came to know that these people were apprehended by the BGB on their side," he said. "It is not known from where they were apprehended, but after apprehending them, they snatched their documents and pushed them about 40-50-metre into the Indian territory from the zero line," Brajesh said. "We also asked them if they crossed from India to Bangladesh, how are their ID cards with them (BGB)? It indicates they were brought by the BGB," the BSF DIG added. Two flag meetings between the BSF and the BGB have been conducted, including a Commander-level meeting held in the area today. Another higher-level meeting will be held on Monday to pursue action towards resolving the issue. The BSF has been providing food and water to the Rohingya refugees on humanitarian grounds. Replying to questions regarding a potential standoff between the BGB and the BSF over the issue, he said, "BSF and BGB have a very cordial, friendly relation. We have regular interaction with them, and there was no such issue in the past, we are in touch with them and we will amicably solve this.